Modern society owes so much to medical research, though what happens behind the scenes in a laboratory is usually far less than glamorous. A group of scientists at the University of Cambridge are working to develop synthetic bone tissue, but the process to create the samples used in the study is incredibly tedious. To make the bones, a substructure must be dipped in a mixture of calcium and protein, rinsed, then dipped in a mixture of phosphate and protein…hundreds and hundreds of times. Equipment that can automate the process is available but very cost prohibitive, so the scientists did what they do best and built a set of robots to do the work for them. Their new bone manufacturing setup was constructed using Lego Mindstorm kits, which were a perfect solution to their problem in several ways. The kits are relatively cheap, easy to construct, easy to program, and able to perform the same function precisely for days on end. Now instead of burning time manually creating synthetic bone samples, the group can focus on the more important facets of their research. 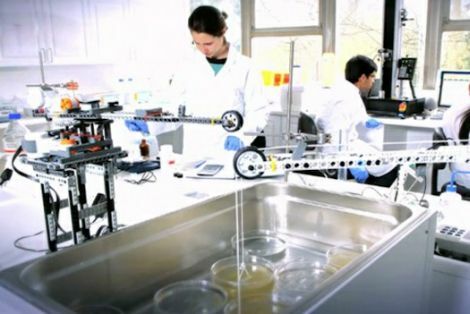 Continue reading to see a video presented at the 2012 Google Science Fair, showing how everything came together for the crew at Cambridge. This is excellent, although I think it could have been simplified by just using a single robot, with a rotating base, and dipping mechanisim. I had a mixer set up on an evaporating mix, and a machine I made for very, very slowly pulling a cold crystal from a warm, very slowly evaporating bath (CZ crystal pulling) over the course of about 2 days. I do not see how a crane build out of micro-controllers would be cheaper and easier to build. Not sure how you would build servos out of micro-controllers. Unless you actually suggest to replace the mindstorm controller with a microcontroller, at which case you missed the point. Because the controller is not the expensive part, building/testing/tweaking the machine is. Naw dawg, I love me some mindstorm, I had myself a mindstorm kit when I was a youngin’. I was just commenting on the fact that they are using legos it what seems like a professional scientific environment. The mindstorms bricks alone cost $150. A $5 microcontroller (or even a $30 arduino) would be able to do everything they need. Unfortunately the only place they’ve also done it with hardware is in the Lego Mindstorm. Why can’t they just spray, spray rinse, and spray the next coat? This is a great example of low cost enabling technology. Some people say garage inventing is over, but I contend it really is a new era. This is a great example of why. You can build cheap robots with off the shelf stuff. You don’t have to ask anyone’s permission. You don’t ned to ask for budget. You just do it. Some people will whine that these are legos and therefore lame, just as they whine about the use of an arduino rather than a stand-alone microcontroller. They miss the point, which is often to get results – not spend hours dealing with minutae that has been solved. I think using Lego was a good choice for one key reason: re-usability. With a pro solution they’re most likely going to be stuck with a robot that dips things. That’s it. With a custom built solution they’d be stuck with a robot that dips things, and possibly not as good. With Lego, today they have a robot that dips things okay, but tomorrow they might need a robot that spins things on 2 axises, and they already have all of the parts needed to do so easily available. Might not be easy, but they won’t have to go drop another $2K on another fixed-function robot. Once they find they’re using a certain design a lot more, then they’ll know that particular fixed-function robot is worth their money and can make a better case for spending grant money on it. Then why the hell are they doing medical research? thank heavens without this video i’d never have known robots were good at helping with science or repetitive tasks. So, some medical scientists who are completely out of their element turn to LEGO to build tampon-dipping ‘bots. Why couldn’t they get some local volunteers from a high-school or community college to do this instead? I can’t believe some kid couldn’t put this together in a day (testing and all). Don’t they care about how unprofessional this looks? Also, if they can’t afford to buy specialized lab equipment, where’s all the money going? This is great! We had competitions for this in high-school and they always required a practical application four our work and encouraged us to find other ‘real world’ implementations for our designs. It is good to finally see one of those applications taking hold in the medical world. So these guys couldn’t scrounge up a slide auto-stainer? Someone really just ended up talking their PI into buying them a LEGO mindstorm kit. Anyways non-sintered HA does not work that well as a bone substitute (poor compressive modulus), not to mention this method will probably lack the requisite porosity.